Another grainy photo, this time, however, graininess is not a theme of the post. I can’t wait to get my hands on my camera. I swear I will never forget it again. Chilli con carne is something I used to make quite a bit but haven’t done for ages. The recipe I use is from the Australian Women’s Weekly and, of course, I don’t have it with me. Such are the woes of living between two houses. There are Australian Women’s Weekly recipes on-line but it is such a long time since I made it, I didn’t know which, if any, of those I was reading was the actual recipe I used to make. In the end, I went with the taste.com.au recipe – on the basis they are, usually, reliable. And it was very enjoyable. I know there are plenty of chilli con carne recipes on-line and I make no claims that this is an authentic recipe. The main reason for this post is: as I was making it, I thought, “What a simple, healthy, family meal this is.” It is a one-pot meal and, when served with a green salad, would be a cheap, well-balanced meal for six. Keep the chillies mild and the chilli powder to a minimum and kids would love it. I decided to write this post just to remind everyone to make it every now and again. The other reason for the post is: that great Catalyst show, “Gut Reaction“, is being repeated this week and next. It is really worth watching. Part one will be on iview and Part 2 will be showing next week. It really impressed me the first time I saw it. It sent me off on a flurry to increase the fibre in our diet. Check out this post which is a short summary of the shows. In essence, we don’t eat enough fibre and, therefore, don’t have a great variety of good bugs in our gut. This results in we Western folk being susceptible to a wide range of diseases. Legumes are a great source of fibre, so be generous with the red kidney beans. chilli powder – use as much as you like. The recipe said 2 x 20 mil tablespoons which is a lot if you are feeding kids. I used 1 teaspoon of hot smoked paprika and one teaspoon of chilli powder and it wasn’t very hot. I drizzled some tabasco sauce into the pot near the end and drizzled some more over my dinner. I will know next time to up the chilli powder. 800g can chopped tomatoes. I used 2 x 500 mil jars of crushed tomatoes. red kidney beans – the original recipe said one 400g can of red kidney beans but I don’t think that is anywhere near enough. I used 250g dried red kidney beans, soaked overnight and then cooked until soft. This resulted in four cups of cooked beans. If you use tinned beans, use at least two tins. Heat a small amount of oil in a large sauté pan. Add the bacon and cook until brown. Reduce the heat. Add the onions and cook, gently, until soft and transparent. Increase the heat. Add the mince. Cook, stirring to break it up, until the mince is well browned. Add the chilli powder. Cook, stirring, for one minute. Add the capsicums, garlic and chilli. Cook until the vegetables are soft. Add the tomatoes and one cup of cold water. (I didn’t need to add any water because there was plenty of fluid in my tomatoes). Bring to the boil then reduce the heat to low and simmer, covered, for about one hour. Add the beans. Cook, uncovered, for a few minutes to heat the beans through and reduce the sauce, if necessary. Serve with rice or corn chips. Top with sour cream, avocado, jalapeño chillies, etc. This entry was posted in Beef, Something Simple, What's for dinner? by Glenda. Bookmark the permalink. Hi Glenda, hope you and Maus are well, we love chilli con carne too and your recipe is just like mime, except the bacon. I make it fairly often and sometimes I add some smoked paprika too. Moya, I hadn’t had chilli con carne for ages. I enjoyed this lot so much I am thinking of making another pot. Great recipe, Glenda. I prepare at least one batch every fall, once the temps cool a bit. I have to admit, though, the way you served your chili, atop rice, that caught my eye. Never thought to serve it that way but I can see the advantages. I have to keep this in mind. Thanks for the inspiration. Hi John, We always serve chilli con carne with rice here. Hi Fiona, I kid myself too. My problem is too much sugar. I will have to make an effort on that one. It is a handy classic dish and so good for families on a budget. Yes, fibre is the key to stomach issues. Must see that show when I return. Francesca, it is a great show, – there are two parts so watch both. BTW, we are going to make your date, walnut chocolate meringue cake for guests this week. I will let you know how it goes. My DIL needed 10 or so more mins than mine. You, as a very experienced cook, will be able to tell if it needs a little more time or not. I used fan forced. Chilli con carne is a great dish, versatile, feeezable and can be served with varied sides inc. on toast. Extra good when the weather is correspondingly chilly. Mince, I think is a wonder ingredient. Even travelling we keep a kilo in the tiny van freezer, plus various tins of beans, tomatoes etc in the “pantry”. Hi Ella, You are right, it is so versatile. As I mentioned go light on the chillies and kids would love it too. I always have a stash of chilli con carne in the freezer And you’re right – I always use 2 tins of kidney beans too I don’t know why recipes only say to use 1. I never put bacon in – I must give that a go next time. Nancy, I don’t think the recipe I usually make has bacon in it but it was a nice addition. Just trying to work out what to serve my daughter and S.I.L tomorrow night. Out all day so I might do this early and have ready. Such hearty fare in such miserable weather. Hi Maree, it is such a blast from the past but still a goodun. 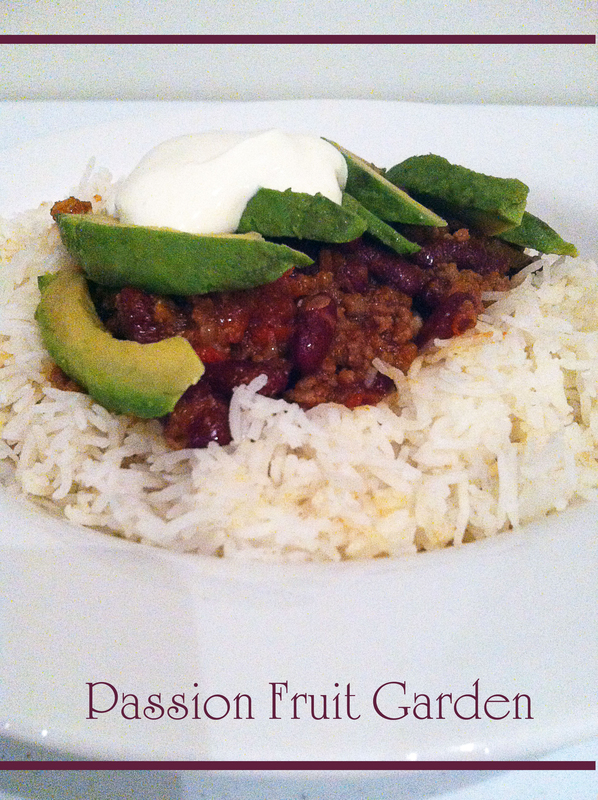 I love chilli con carne… it’s on our menu regularly. Liz, I used to make it regularly but haven’t made it for years. I don’t know why things come in and out of favour. NB. Also, what about some tomato paste…? Thanks so much for this reminder – I LOVE chilli & this is definitely the weather for it! Hi Kate, Cumin seems to be a common addition but I have never seen fennel seeds, nor tomato paste. I have just checked out a Mexican cookbook I have, and that recipe includes oregano. I guess anything goes with this one. It is a bit like spag bol. BTW Thanks for stopping by and commenting. Hi Kate, I have just got back to Perth and checked out my 1973 recipe. It has tomato paste and oregano, but no tomatoes. Obviously there are a million versions. Lovely hearty comforting meal Glenda. Thanks Mandy, it sure is.